Tentative Event Schedule Now Posted! How lucky are we? We get to kick off our year long celebration of the amazing 45th Anniversary of STAR TREK in the world's most beautiful place: HAWAII! For one glorious weekend, December 4-5, 2010, we are rolling out the red carpet for everyone to join us for a two day party like no other! 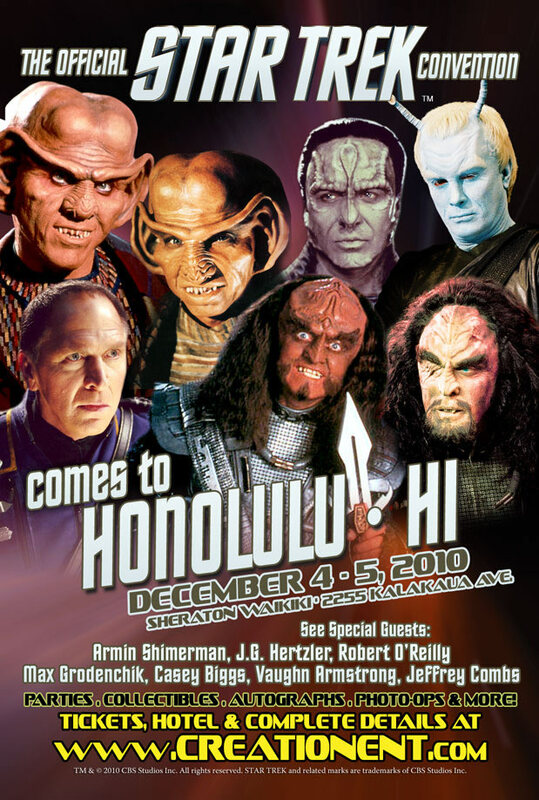 We invited Star Trek celebrity guests that we know are ultra-fan-friendly to come with us to Hawaii and we have a non-stop program of events designed for your pleasure. Better still, all of our guests, along with their standard convention appearances, are coming to perform in song and comedy. We can't think of a better way to spend a weekend! 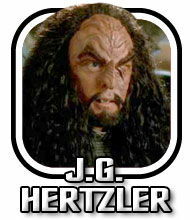 This is so cool that we even have representatives of the Klingon Empire joining us, the legendary MARTOK (as portrayed by JG Hertzler recreating his role) and the one and only GOWRON (played by Robert O'Reilly). You can't miss this! We are pleased to announce that two classic Star Trek series guest stars will be joining us for the weekend to speak, meet fans and offer their autographs for a nominal fee. 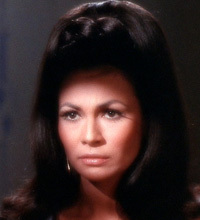 BarBara Luna portrayed Lt Marlena Moreau in "Mirror, Mirror". Her other roles include the second season premier show of the Original Hawaii Five-O, Buck Rogers in the 25th Century, Walt Disney's Zorro, The Outer Limits, Wild Wild West, Bonanza, The Big Valley, One Life to Live and The Invaders. Ms. Luna starred in "The Devil at 4 O'clock" starring Frank Sinatra and Spencer Tracy which was filmed in Maui. 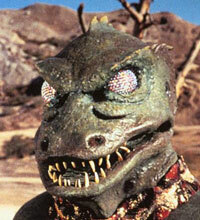 Bobby Clark created one of Star Trek's most popular and enduring "villians" when he played the legendary Gorn in classic Trek's Arena. In a career that has spanned six decades, he appeared in many famous television series including Perry Mason,The Danny Thomas Show, Lassie, Bachelor Father, Kung Fu, Gunsmoke, The Virginian and many more. 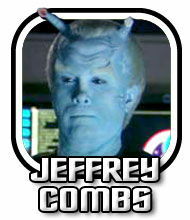 He also was seen in three additional classic Star Trek episodes: The Apple, The Return of the Archons and Mirror, Mirror. Here's our promo card, let us know if you can distribute any of these in yo areura in Hawaii so we can have a great turn-out! We appreciate the help as we want to come back again! Click the image for full-size! Super-talented MAX GRODENCHIK has written a hilarious and fun evening music and comedy show done in the style of the classic Vegas "Rat Pack" and featuring himself and fellow Trek celebrities VAUGHN ARMSTRONG, JEFFREY COMBS, CASEY BIGGS and ARMIN SHIMERMAN. This show was a smash hit at our Vegas Star Trek Convention and we knew we had to bring this performance to our fellow fans in CHICAGO. The STAR TREK "RAT PACK" Cabaret Show is complimentary for our GOLD WEEKEND PATRONS (keeping your same great seats). FOR ALL OTHERS, GENERAL ADMISSION TICKETS ARE $15 available in advance or at the convention. 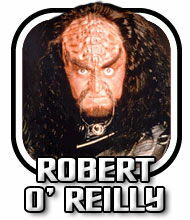 Martok and Gowron have agreed to sit down at the table with humans for a "blood brunch" on Saturday! This is an experience you won't be able to repeat as The Klingons are coming to Hawaii one time only! Tickets are $39 each including a delicious meal, so don't miss out! Lmitied attendance event. Presented by Inge Heyer. With an BA in physics and astronomy Inge then attended the University of Hawaii at Manoa, where she obtained a master's degree in astronomy, and pursued many years of research, which often took her to the observatories atop beautiful Mauna Kea. From 1992 to 2005 Inge was a senior data analyst at the Space Telescope Science Institute in Baltimore, working on images obtained by the Hubble Space Telescope's Wide-Field and Planetary Camera 2 (WFPC2) as well as the Advanced Camera for Surveys (ACS). Created by Brett Botbyl, this exciting performance tells the story of the crew of space station Praemos over the planet Aragos. The station is the first of its kind - a starting place for the advancement of interplanetary trade with neighboring worlds. Formally enemies. the people of Aragos have come together in hopes of discovering the origin of their world and building a peaceful future. As exploration broadens the skies, hope is renewed when a galactic federation from across the galaxy reaches out a hand of peace. Featuring special appearances by: ARMIN SHIMERMAN, MAX GRODENCHIK, VAUGHN ARMSTRONG, CASEY BIGGS, AND JEFFREY COMBS! Winners will receive a $100 gift certificate good for Creation products. Winners will be announced and certificates awarded on site; if you are not present we will mail the certificate to you so be sure to include your return address, phone number and e-mail. You may email our offices at sharon@creationent.com to confirm receipt of your entry but we do not announce winners until the event. All entries are due at Creation offices by November 5th, 2010 with no exceptions. Thanks and good luck! 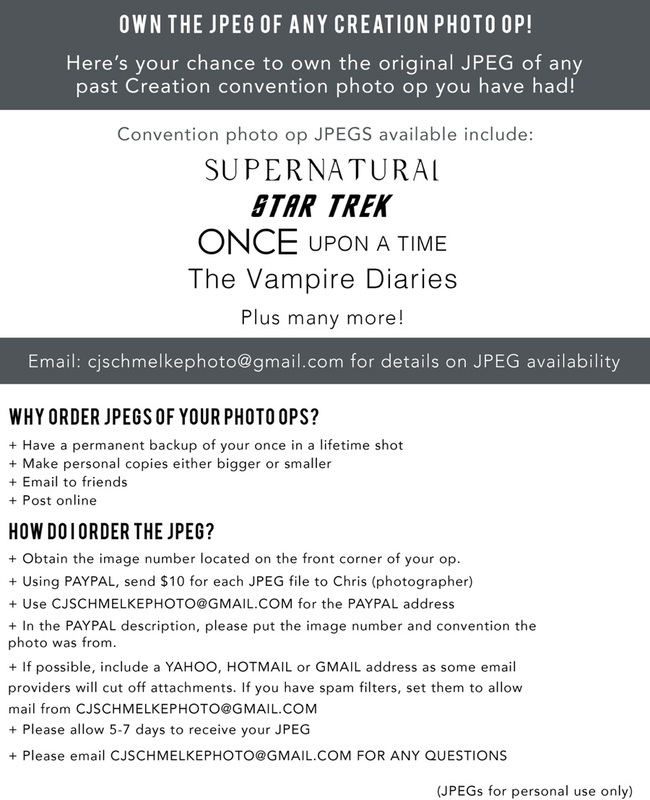 Here is the absolute top of the line best way to attend the full two days and get all the extras! 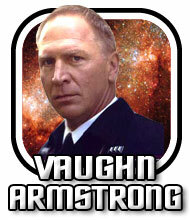 Here's what you get when you "GO GOLD" for the Official STAR TREK Convention in HONOLULU. The price is unbeatable! 1) The absolute best reserved seats in the main theatre where all our major guests appear! These seats are YOURS, come and go, all weekend! Great for photographers too! 2) Complimentary in-person autographs with amazing guests including ARMIN SHIMERMAN, JG HERTZLER, ROBERT O'REILLY, VAUGHN ARMSTRONG, JEFF COMBS, and CASEY BIGGS. That's right: you get all these in-person autographs when you "GO GOLD"! The value of these autographs ordered separately it would cost you more than the GOLD PACKAGE PRICE: tell us that isn't awesome! 11/29: Max Grodenchik is no longer included in complimentary autographs. We will be giving all Gold and Preferred Patrons $40 worth of Star Trek pre-signed autograph photos instead when they arrive at registration. 4) Complimentary admission to our SATURDAY NIGHT STAR TREK "RAT PACK" PERFORMANCE starring ARMIN SHIMERMAN, MAX GRODENCHIK, VAUGHN ARMSTRONG, JEFF COMBS and CASEY BIGGS! This is an absolutely wonderful show of Star Trek parody music and jokes that you will LOVE! Keep your same great seats and enjoy! 5) 8) EXTRA SUPER-SPECIAL BONUS: CREATION'S STAR TREK DESSERT PARTY after The Rat Pack Show on Saturday Night: chill out and enjoy a festive night of fun (AND delicious free dessert) with fellow fans and our amazing celebrity guests: ARMIN SHIMERMAN, CASEY BIGGS, MAX GRODENCHIK, JEFFREY COMBS and VAUGHN ARMSTRONG! Creation parties are famous for the interaction between our attendees and our guests and here you'll see why! This is going to be so much fun and well worth the entire cost of the package! Please note that this event is TOTALLY EXCLUSIVE for GOLD WEEKEND PATRONS ONLY: so "Go Gold" and take part! And note that you are invited to bring a Star Trek themed Centerpiece to this party and try to win a $250 gift certificate for best design! 7) Wristband access: we have special color coded wristbands and collectible lanyard credentials for GOLD Package Holders: once you get set you don’t need to wait again! 8) Admission to the vendors room. 2) Complimentary in-person autographs with our SEVEN great guests including ROBERT O'REILLY, ARMIN SHIMERMAN, VAUGHN ARMSTRONG, JEFFREY COMBS, CASEY BIGGS and MARC ALAIMO. This is an amazing deal because if bought separately these autographs would cost way over the price of this package! 11/29: Max Grodenchik is no longer included in complimentary autographs. 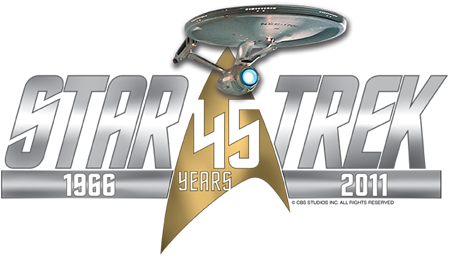 We will be giving all Gold and Preferred Patrons $40 worth of Star Trek pre-signed autograph photos instead when they arrive at registration. Here is the most economical way to attend both daytimes of the convention. You get to see all the guests and events in the main theatre from a non-reserved seat and of course you get admission to the vendors area. This option does not include autographs which you can order separately below. Max's autograph is not part of any package and must be ordered separately. A once in a lifetime area exclusive: YOU with two famous Klingons! All in their tuxes, get this super-cool photo of Casey Biggs, Jeffrey Combs, Vaughn Armstrong, Max Grodenchik and YOU! Armin Shimerman and Max Grodenchik and YOU! Quark and Rom reunited! 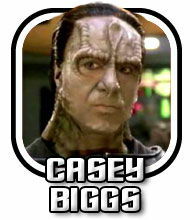 Call 1 866 716 8109 for reservations, mentioning The Official Star Trek Convention to get these great lower than normal rates. NOTE: This schedule is highly tentative but for those traveling in we wanted to give you an idea of the schedule. Please check back here towards the end of the week for any updates/changes. 1:50 pm The Star Trek Yes/No Trivia Competition: Here's your chance to win $1750 in gift certificates by knowing it all about all things Star Trek! Be in the audience to participate! 4:05 pm The Star Trek and Sci-Fi No Minimum Bid Auction: tons of super-cool collectibles, including our famous banners, all up for grabs at great bargain prices in this fast paced event! 5:25 pm Photo Ops with "THE STAR TREK RAT PACK AND YOU!" Take some time to reminisce about the stars we grew up with and learn what William Shatner, Leonard Nimoy, Nichelle Nichols, George Takei, Walter Koenig, and Grace Lee Whitney are up to today! 6:05 pm Autographs with JG Hertzler, Robert O'Reilly all complimentary for Gold Weekend and Preferred Weekend Patrons (we will call by row) followed by those with autograph tickets, available at registration for $15 for each star. 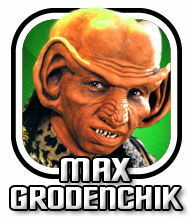 NOTE: Max Grodenchik will be in the vendors room at various times during the day to meet fans and offer his autograph. Autograph tickets for Max are available at registration for $15. Originally Max's autograph was part of Gold and Preferred Weekend, but we are instead giving all Gold and Preferred Weekend Patrons $40 in pre-signed autographed photos instead. You will get those when you arrive at registration. Music and song parody stylings written by Max Grodenchik, and starring Max, Armin Shimerman, Jeffrey Combs, Casey Biggs and Vaughn Armstrong! Not to be missed, complimentary for our Gold Weekend Patrons, for all others general admission is $15 a ticket. 12:30 pm Star Trek Trivia Game: "Stump The Experts" here's your chance to win valuable prizes and gift certificates by stumping our panel of Trek know-it-alls! Be in the audience to participate please! 2:20 pm ALIEN WORLDS: Real and Imagined with Inge Heyer With new and more sensitive technology it has finally become possibly to search for planets around other stars. Since the age of science fiction people have imagined what other worlds might look like, now we can at least infer some of their characteristics. It won't be long until we will be able to take pictures. What are these worlds like? Can we compare them to our planets? And if there should be life on these worlds, how might it perceive the Universe? We will go on a journey, both fanciful and very real, to see what we have found in our search for alien worlds. 3:00 pm Costume Competition with $250 first prize! Come dressed as your favorite Trek character or come to watch and applaud the contestants: contestants please be in the theatre at 3:00 pm, no need to sign up first. Everyone who enters wins a prize! 3:25 pm "THE CHILDREN OF ARAGOS"
Check out this special half hour preview presentation! 4:35 pm The 2nd Creation Star Trek and Sci-Fi Media No Minimum Bid Auction: The last chance to grab fast-paced bargains in special rare Trek/genre products and collectibles! 5:45 pm Armin and Max Grodenchik: The Quark Family Reunited! 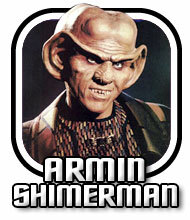 6:20 pm Autographs with Armin Shimerman, Vaughn Armstrong, Jeffrey Combs and Casey Biggs, complimentary for Gold Weekend and Preferred Weekend Patrons (we will call row by row) followed by those with autograph tickets, available at registration for $20 for Armin and $15 for the others! (we will call these by number). 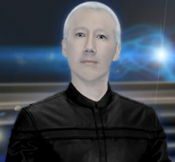 NOTE: Max Grodenchik will be in the vendors room at various times during the day to meet fans and offer his autograph. Autograph tickets for Max are available at registration for $15. THANKS FOR BEING WITH US, WE REALLY APPRECIATE IT!